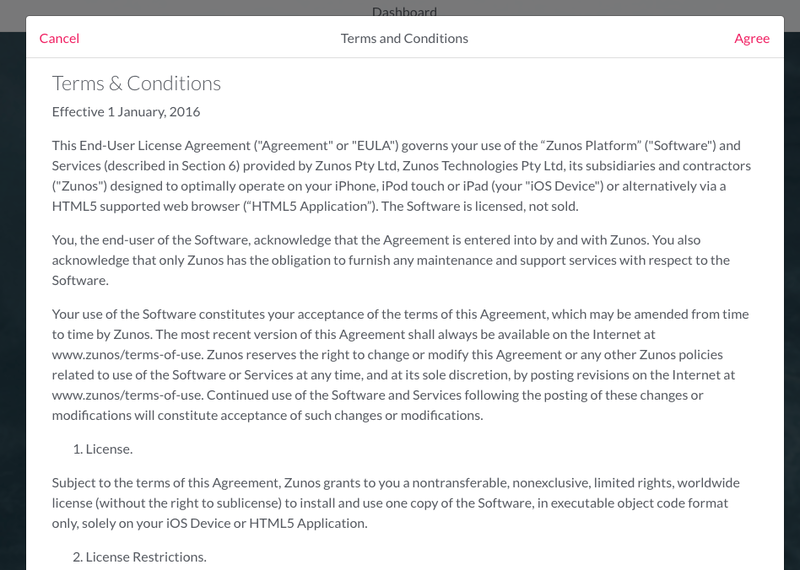 Zunos gives administrators the ability to define a set of Terms & Conditions that their users must agree to before they can access content in the Zunos iOS App or WebApp. The Terms & Conditions will be presented to the user on first use, or after the terms have been updated if the Administrator chooses to re-prompt users to agree. To set the Terms & Conditions can be set by logging into the Zunos admin portal and following the steps provided below. 3. If you are updating your Terms & Conditions, you can use the Reset T&C's for all users button which will force all users to view and accept the terms the next time t they log in. When logging into either the iOS App or WebApp, users will be presented with the following screens where they will be required to accept the Terms & Conditions before being able to access their account in Zunos.